2) Are you still singing? Here’s the scoop on my current continuing location. First, I was trying to sell my house last summer. That wasn’t happening, and I got impatient. I decided to pull it from the market in December, and to rent it out at whatever point I am able to leave. Since then, I’ve been applying for jobs in Cheyenne and Fort Collins when they present themselves, during the busiest time of year at my existing job in Great Falls. Our major deadline for the year is on Monday, which, this year, happens to fall right *after* Easter. That has nothing in particular to do with anything, it just manages to be somewhat inconvenient. I have a few leads, and now that it’s a better time for my employer to be suddenly without me (well, there’s never a good time for that, but they’ve known for at least a year), I feel less bad about dashing out of the state. I’m hoping to be out of here, for real, by the end of May. The first three months of the year, especially March, can get a little overwhelming and emotional. Between unexpected emergencies at work and the dreariness of winter, Jordan being far away and a stagnating living situation, it’s been kind of a tough one. Where I usually tend to be proactive and driven (ha), this spring has been a little more about survival than living. It’s silly, because we all know how freakin’ good I’ve got it. Still, I haven’t been my usual self, and while April tends to bring that back out of me in any given year, I’m looking more forward to it this year than I have in a long time. So, to answer the second question…yes, I’m still singing. Mostly karaoke. I know, I know, there are a few (very talented) music school snobs in town who will tell you karaoke isn’t for real musicians. I would say, it’s as real as you make it. My voice is probably at its best when I sing karaoke 2-3 nights a week and practice new songs for it the rest of the time. I don’t think it matters too much where you sing–if you love it, DO it! At every opportunity. So anyway, right now I’m putting my performance energy into a contest they’re having at the Beacon. The last night of finals is coming up on Thursday, April 4. I haven’t chosen my songs yet, but I’m hoping to by the end of the day. This last week was rock week. Each contestant (there are a whopping seven of us) had to sing a rock or pop song, and any other song of their choice. I sang “Whiskey in the Jar” (the Metallica version) and “Dream On,” by Aerosmith. Crowd-pleasers, both. I have to say, I really get a charge out of it when people I don’t know come up to me and tell me how much they enjoyed my performance. That’s why I love contests. 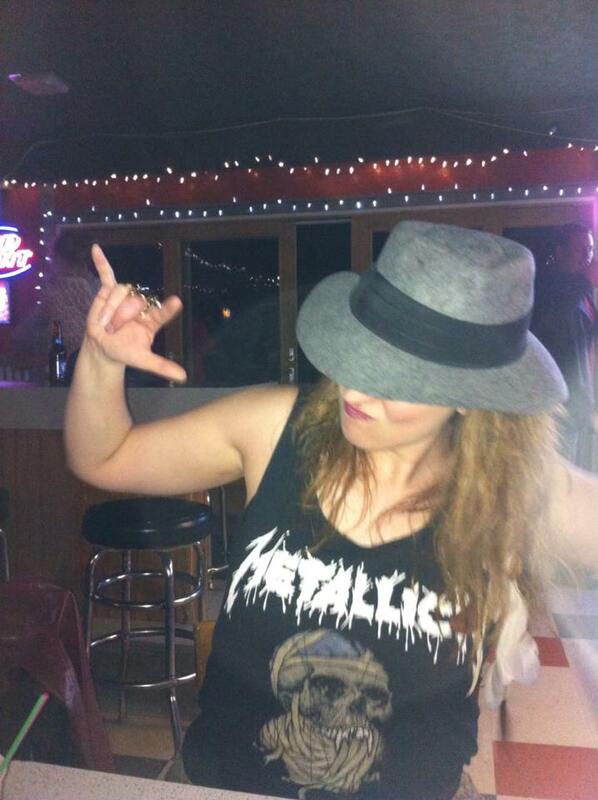 If you show up at a regular karaoke night in a fedora with a mic stand, at best no one would care, and at worst, you’d get laughed out of the bar….and/or accosted by a drunk comedian who wants to make your solo a duet. I know I’ve blogged about these contests before. For me, they’re a chance to perform, and to hang out with my friends, at least the ones who like to sing. I’m psyched because my BFF Erin has been doing the contest, too, and she has a real knack for song choice. In the meantime, writing has been back-burnered, since I had to take down my sweet writing setup for showing the house. I still have a piano in the basement, but I don’t spend nearly the time hanging out down there as I would expect to, given that it’s the best room in the house for hanging out in. Something about proximity to the kitchen. And now,it’s time for breakfast. I had bacon for dinner on Thursday night, and made a ton of extra. When I came home after midnight, I saw the leftovers, wrinkled my nose in disdain for Lent, and left them in the fridge. Now it’s Saturday. And I’m a-gonna bacon it up. « Deadlines, or Life Lines?